Based on my survey a lot of Mis Clases Locas readers want even more posts for teaching with novels. If you want to dig in the archives, here are 80 posts with the label novels. 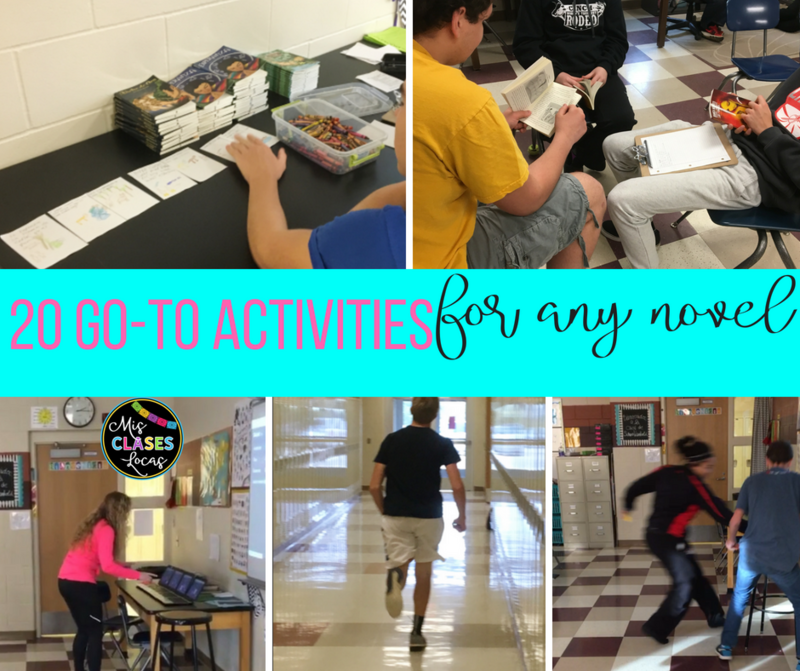 I wanted to put together a resource with go to activities that could be used with any novel and any language. I always recommend buying a teachers guide for a novel, since they save a tremendous amount of time. 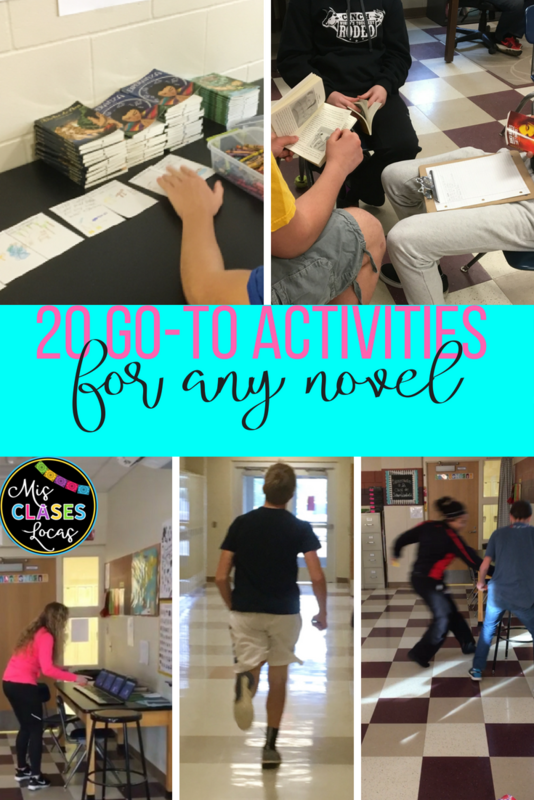 Once you have a guide, then here are 20 ways you can mix up activities based on resources that are already included. (I only recommend doing a couple total activities per chapter of a novel). I like to do a lot of vocabulary introduction before even starting the book. Then every couple of chapters I pick from an activity below to introduce a few newer words. GimKit is a newer way to use to utilize your Quizlet sets in a competitive way earning "money." See this post for more information. Quizlet Live is always a go to option for me, but mix it up and get students moving with Quizlet Live Relay Race. Write vocab words on little pieces of paper. (You may also want to list what you are using on the board as well). Divide the class into two teams. Students act out the vocabulary words without talking as their team guesses. Write vocab words on little pieces of paper. (You may also want to list what you are using on the board as well). Divide the class into two teams. Students draw the vocabulary words on the board without talking as their team guesses. Have students line up in 2 lines facing each other with a marker or object between each pair. Student grab the object if it is true and leave it if it is false. See the full description and rules in this post about The Marker Game. Designate each side of the room as true or false. Students move to that side depending on which they think the statement is. Have students create a ten question true/false quiz over the chapter or story including an answer key. They then give these quizzes out loud to three classmates, scoring them as they go. A dictation relay race gets everyone up and moving, as well as can extend into ordering event. Learn more in this post about Running Dictation. Copy the order of events for a chapter found in a teachers guide or just pick 8-10 events to type up large. Copy each set on a different color paper (so sets do not get mixed up), cut them apart and have students work to put them in order. Paper clip together and stick in a sheet protector to use again the next year. Post chapter numbers along a wall or board. Give students a post it note to write main events and put them up in order of the book. This could also be done with pictures as well. If you want to use tech, use the Jumble feature of Kahoot to put events in order. Character Description or Who Said it? Have 4 characters posted around the room. When you read a quote or description, students walk to that corner. Check out 4 Corners with a twist for another way to mix it up. Read a quote or description and students write the answer on a whiteboard. This can be done in pair or a team as well as a competition. Type up quotes or descriptions, cut them apart and give each student one. Students walk around reading their quote, while others guess who they are. As a class - Read and discuss questions as a class with projected questions. In pairs - Students discuss the questions out loud with a partner. Alone - Students answer the questions and then later discuss with the class or small group. Search Kahoot for comprehension questions that you can adapt before you start from scratch. You can also create a GimKit with multiple choice questions. Students can work as a team in class, individual, or even as homework. Have a blank piece of paper at each desk or table. Students start retelling the story or chapter. Play music as students walk. When the music stops they continue where the first person left off. Students use a storyboard or Smashdoodle to retell what happened in the story or chapter to the partner across the line. At a bell or change in music students shift down and repeat. Get students up and moving to retell a chapter or story with this activity from Carrie Toth. Students start retelling the story or chapter on a piece of paper. Students crumple it up and "snowball fight." When the music stops, they pick up a piece of paper and continue where the first person left off. Repeat a couple of times. If you have a 5-10 minutes left at the end of class, have students get out a piece of paper and write down as much as they can remember. Print off one of the multiple versions once you have finished a book and let students go around and ask each other questions! Well now you know some of my favorite activities to use with any novel chapter or story. What would you add?